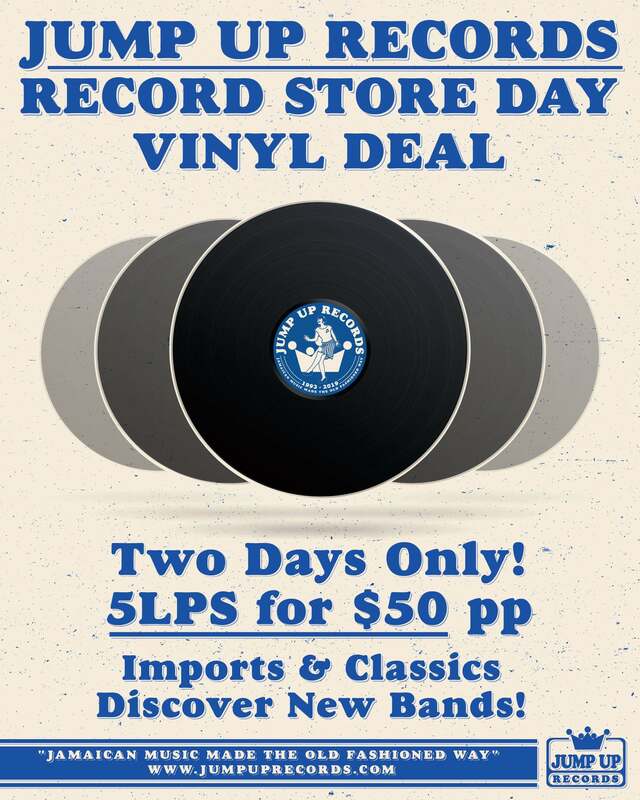 Record Store Day Vinyl Deal EXTENDED – 5 LPs for $50 postage paid in USA ($65 shipped worldwide)- Discover New Bands NOW! DEAL EXTENDED THROUGH EASTER SUNDAY! Here at Jump Up EVERY DAY is Record Store Day! 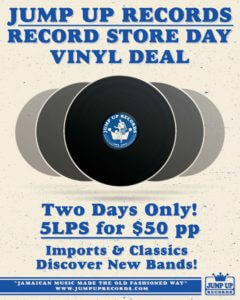 We know you spend a ton last weekend – so we’re gonna give you a break for TWO DAYS and let you get FIVE LPs for $50! Limit 2 deals per customer. FYI: black vinyl versions are picked first, but many titles only remain in color vinyl – this means lots of color vinyl coming your way! After making payment send list of choices to jumpuprecords@gmail.com with the subject line RSD DEAL! Check out this amazing list of Jump Up label selections and imports! PICK 5 from the BELOW lists! Shop early for your friends with this deal! 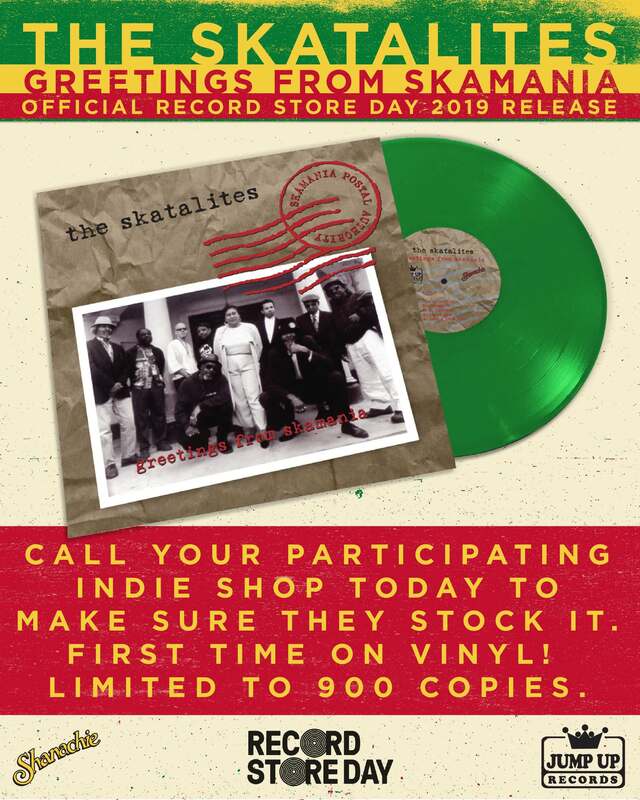 Continue reading Record Store Day Vinyl Deal EXTENDED – 5 LPs for $50 postage paid in USA ($65 shipped worldwide)- Discover New Bands NOW! 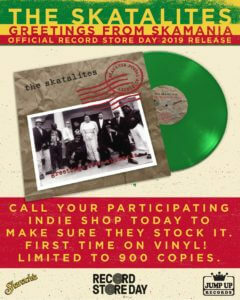 Official Record Store Day 2019 Selection: THE SKATALITES “Greetings From Skamania” LP – green wax with poster! 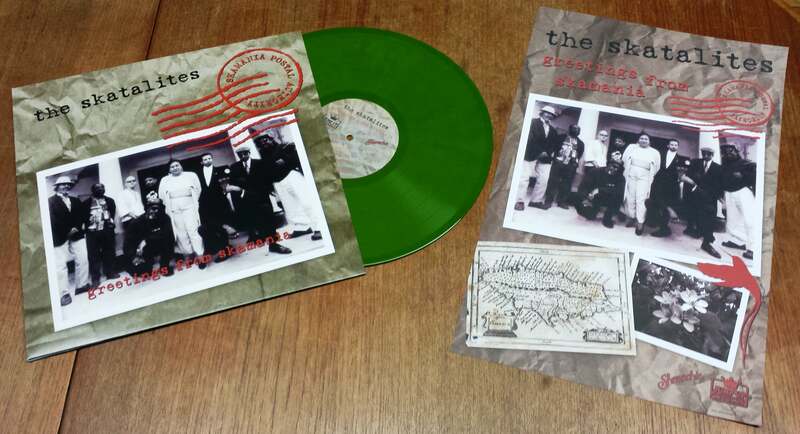 First time on wax for Jamaican ska originators’ 1996 masterpiece, green vinyl edition with poster insert exclusive for Record Store Day. 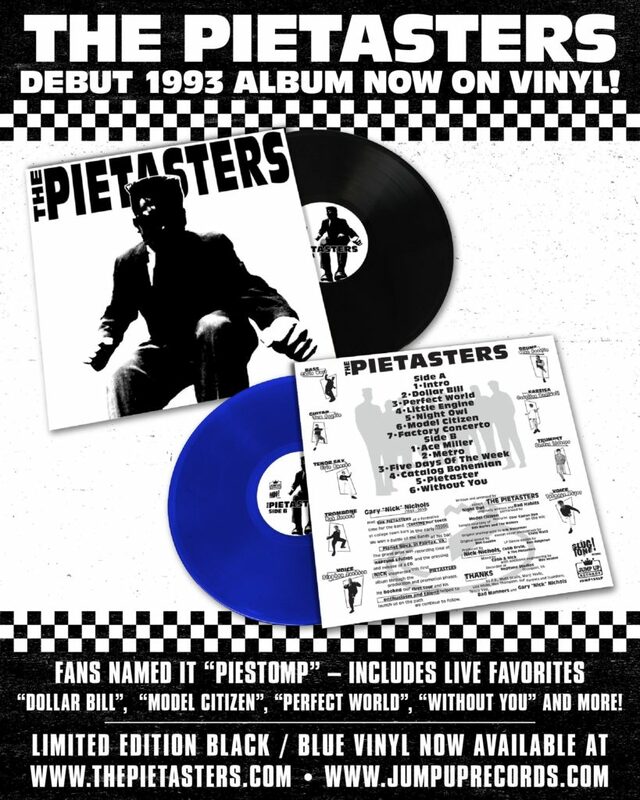 Produced by Joe Ferry (Big Ska Band, SKAndolous All Stars) and band leader Tommy McCook, On this set original 60’s players are still going strong – lead by the saxophone trio of Tommy McCook, Roland Alphonso, and Lester Sterling, drummer Lloyd Knibbs, bassist Lloyd Brevett, and vocalist Doreen Shaffer. 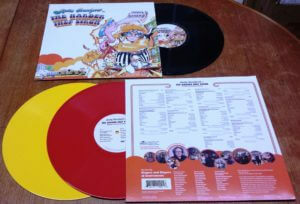 The band revisits 60’s gems like “Phoenix City” , and “El Pussycat” while creating many new classics including “Skalloween”, “Trip To Mars” and “Skamania”. The Skatalites perfected the big-band ska sound while backing some of the finest ska and rocksteady artists in the 60’s, and this album is another crowning jewel in their lifelong goal to party like it’s 1964! 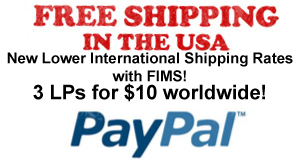 Less than 75 copies exist for our mail order! Andy Bassford, born in Hartford, Connecticut, is the reggae legend you’ve never heard of. After initially playing several years in rock, reggae, latin jazz, and country bands, he then was discovered by Horace Andy, which led to his recording debut on the classic album ‘In The Light’ in 1977. In 1980 he went to Jamaica and began playing on sessions with the Roots Radics. Soon after he joined Lloyd Parks and We The People, thus performing or recording with nearly every reggae artist of the era, most notably Dennis Brown. Upon his return to the US in late 1980’s he joined Toots and the Maytals among many others and became the house guitarist for the seminal Studio One label. Currently, Andy performs internationally in Jamaican pianist Monty Alexander’s Harlem-Kingston Express reggae-jazz fusion project, with whom he has also recorded two albums. In 2003, he was honored by the Jamaica Federation of Musicians for Outstanding Contributions to the Jamaican Music Industry, one of the only-non Jamaicans to receive this award. In 2019, he won his first Grammy as a composer and guitarist on Sting & Shaggy’s “44/876”, which took the honor of best Reggae album. Andy Bassford’s first ever solo album “The Harder They Strum” pays homage to the movie and album that lured Andy into the wonderful world of Jamaican music. It’s a song by song remake of the world famous soundtrack, of the ten original vocal tracks six are turned into guitar instrumentals, and the rest come with vocal parts from New Kingston and Soul Sisters Six. Other notable guests on the album include Monty Alexander, Mikey Chung, Kevin Bachelor, Larry McDonald, Bret Tubin and many more. Andy explains his reasons for recording the album: “My idea was to pay homage the original versions while allowing me to improvise and elaborate on them… I wanted it to reflect my personal and musical values all the way through, from start to finish… I also wanted to document the musical relationships and friendships I’ve developed over my career.” LP vinyl is finally available due to massive demand – limited edition on yellow and red vinyl. Oh yea, we have also issued this on 8 TRACK TAPE! We are taking you back to the 70s with the format that kept music on the move – and we sourced original pink ISLAND RECORDS outer sleeves from the 1970’s too! 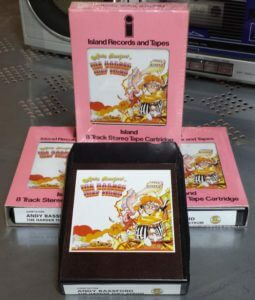 8 TRACK TAPE is limited to 25 copies and is the ultimate collectible. 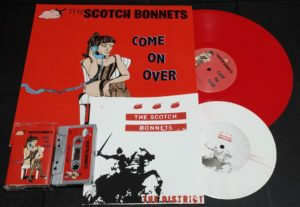 THE SCOTCH BONNETS “Come On Over” LP + 7″ vinyl / CD/ Tapes – produced / mixed by Dave Hillyard & Agent Jay of The Slackers! Punky reggae rockers from Baltimore whose infectious energy keeps the party jumping all night, The Scotch Bonnets have been bringing the heat and the good-love vibe since their debut in 2009. The crew is fearlessly lead by singer-guitarist Kristin Forbes aka Lady Hatchet, whose tunes blend classic Jamaican groves with a funky fresh approach to American singer-songwriting. Continue reading THE SCOTCH BONNETS “Come On Over” LP + 7″ vinyl / CD/ Tapes – produced / mixed by Dave Hillyard & Agent Jay of The Slackers! 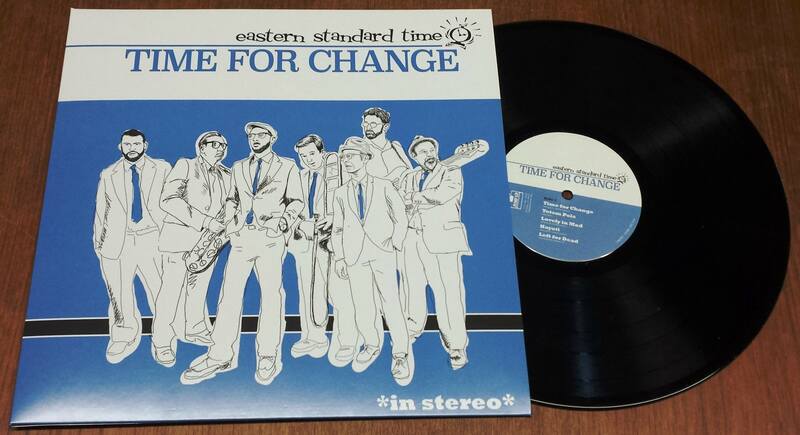 EASTERN STANDARD TIME “Time For Change” LP – Wash DC’s Ska-Jazz pioneers are BACK! Come to the CAPITAL SKA & REGGAE REVIEW May 24th in DC! Washington DC’s messengers of Ska-Jazz are back with a new record, their first full-length release since the critically acclaimed “Tempus Fugit” and first release since appearing on Derrick Morgan’s live album in 2017. “Time For Change” embraces the band’s signature sound of bop jazz and Jamaican rhythms, and blends this with with soul, rocksteady, and reggae Whether in a smoky jazz club or on a festival stage they always deliver a dynamic live performance. That signature flexibility has led to them becoming backing musicians for many Jamaican greats, including Derrick Morgan, Roy Ellis, Dr. Ring Ding, King Django, and Mr. T-Bone. Formed in 1995, Eastern Standard Time began as a project to bring musicians from Washington DC’s jazz and Caribbean communities together to play music based on the original Jamaican Ska. Over the years the membership crystalized into a seven-piece group primarily blending American soul and jazz with danceable Jamaican rhythms from the 50s to the 70s. Eastern Standard Time has logged years on the road, with dozens of tours throughout Europe and North America to their credit. As 2019 dawns Eastern Standard Time will be touring throughout Europe, North America, and beyond in support of Time for Change. Heavyweight black vinyl pressing for premium audio quality. Continue reading EASTERN STANDARD TIME “Time For Change” LP – Wash DC’s Ska-Jazz pioneers are BACK! Come to the CAPITAL SKA & REGGAE REVIEW May 24th in DC! BIM SKALA BIM “Bones” on LP vinyl for the first time! 1991 classic expanded with 3 bonus tracks! 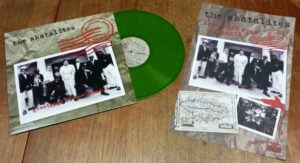 Legendary 1991 alt rock/ska album on vinyl for the first time, adding 3 bonus tracks from the original sessions. Boston’s Bim Skala Bim are one of a handful of veteran ska bands that have kept ska in America alive through the decades, and for this set the group collaborated with Lou Giordano and other rock producers. The lyrics were more focused than on previous efforts, highlighting the group’s political engagement and familiarity with contemporary futuristic literature. Taking their cues from the jazz oriented Skatalites rather than British 2-Tone, this early release by the group’s five core members shows why they were one of the best. Dan Vitale’s compelling lead vocals and Jim Arhelger’s drums are firmly rooted in the rock arena, but they meet the band’s swelling horns and jazzy ska arrangements for a smooth, upbeat sound that’s paced at just the right tempo to demand dancing. 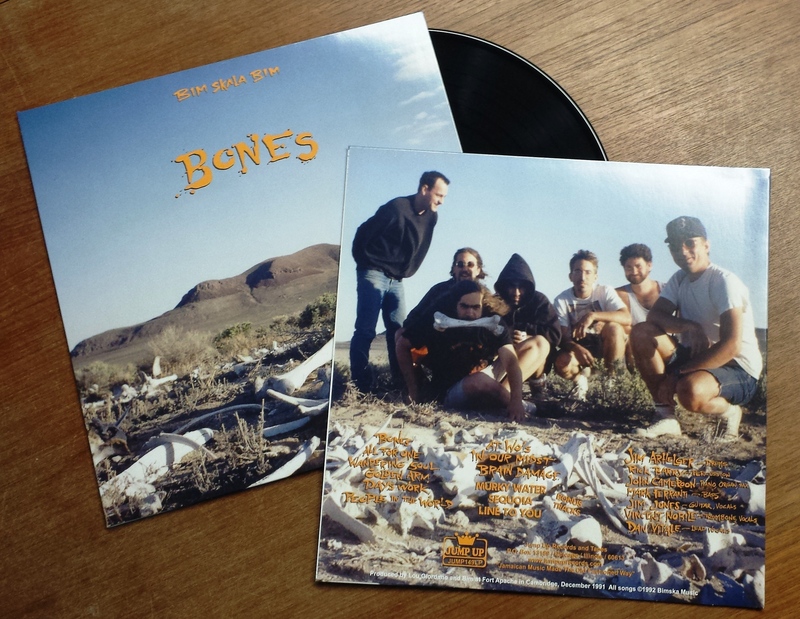 For many of the band’s most devoted fans, “Bones” was the quintessential summer album, tunes like “Wandering Soul”, “In Our Midst”, “People In The World” and “At Wo’s” became the beach party soundtrack for college towns all across the Eastern seaboard. This has been in production for a LONG time (pressing mishaps out of our control) – but totally worth the wait! Limited edition of 500 with 200 on clear orange vinyl. Mento Madness from LOS APARTAMENTOS – debut album “WATER DI GARDEN” out now! Los Apartamenos have been spreading Jamaican mento folklore since 2016 – from private pool parties to international festivals. Mento is a style of Jamaican folk music that predates and has greatly influenced ska/reggae music. It is often confused with calypso, a musical form from Trinidad and Tobago, and although the two share many similarities they are distinct musical forms. Mento’s focus on acoustic instruments is preserved here, and all songs were recorded with one microphone with nearly no overdubs, capturing that old timey feel. Members of Los Apartamentos have played in well known German ska acts The Braces, Monkey Shop, and Kapelle 3. This debut album is inspired by 1960’s Jamaican sessions by Count Owen, Lord Fly, Count Lasher, and Lord Flea, and was produced by Boss Van Trigt (Boss Capone, The Upsessions) in the Masons Arms studio. “Water Di Garden” is guaranteed to excite the tourist inside you as you cry “take me to Jamaica where the rum comes from!” You loved our limited edition flexi postcard – now get the debut full length! Limited to 300 copies on black and poolside blue vinyl. Continue reading Mento Madness from LOS APARTAMENTOS – debut album “WATER DI GARDEN” out now! 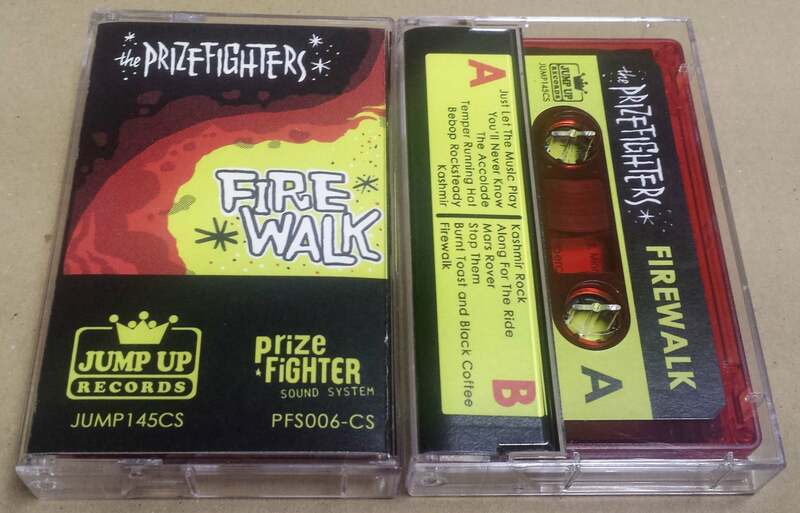 THE PRIZEFIGHTERS are back! 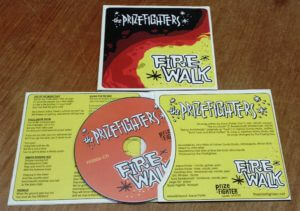 New album “Firewalk” out on CD/Tape – vinyl coming soon! 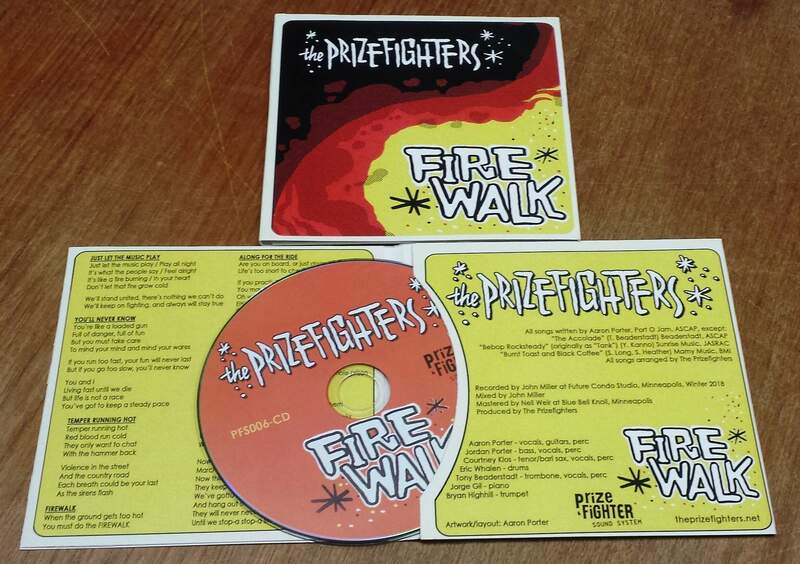 The Prizefighters perform ska and rocksteady from Jamaica’s golden era, their brilliant new studio album “Firewalk” is their first since 2010’s “Follow My Sound”. Since that release the band has perfected their craft working side by side with the stars that created the music back in the 60’s. That resume is now quite impressive, it includes backing the “King of Ska” Derrick Morgan at Reggae Fest Chicago, twice with Stranger Cole including a duet show with Patsy, plus Chicago and Montreal showcases with the dazzling Roy & Yvonne. 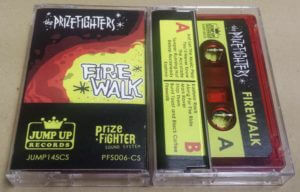 Their relationship with legendary harmonica player and vocalist Charley Organaire might be the most special, as he joined The Prizefighters in the recording studio for a session that lead to the 2014 mini-album Charley Organaire Meets The Prizefighters which lead to their first European tour. In the band’s words “it’s not just about playing the songs well; it’s about playing them correctly and authentically” – and the several years worth of authentic 60s Jamaican music conservatory experience between the first record and “Firewalk” really shows. Working hard on tunes with a mantra of “will this be good enough for Derrick Morgan? Or for Stranger & Patsy?” has conditioned the band to push themselves to ever higher standards. We are so proud to present this stunning new album in 2019 from one of our favorite bands. Let’s face it, without The Prizefighters we wouldn’t have been able to bring so many Jamaican legends to Chicago and keep the spirit of 60’s Jamaica alive. Currently available on CD and Tape, vinyl coming soon! CD and tape will be part of the subscription clubs.